Toronto and Region Conservation Authority (TRCA) monitors plants and animals in forests, wetlands and meadows across our regional watersheds by conducting biological inventories and assessments and surveying long-term fixed plots. 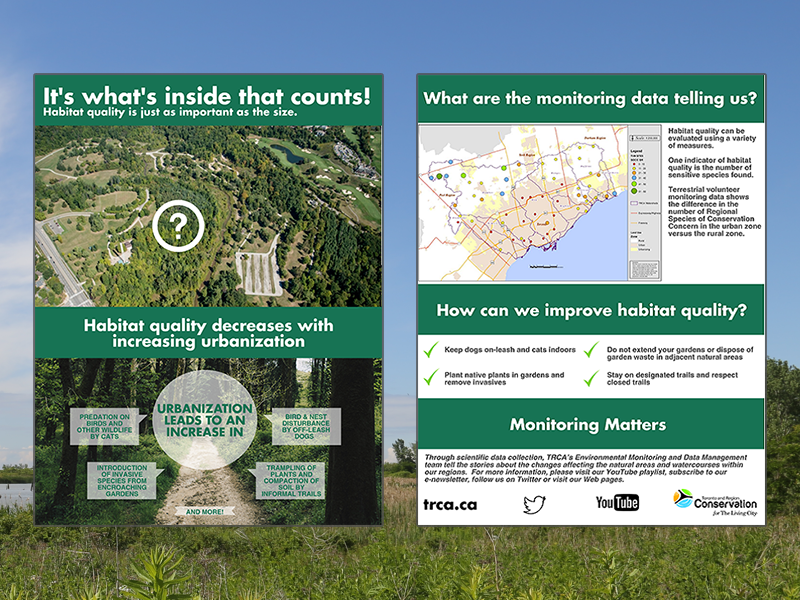 TRCA has implemented long-term monitoring in forest, wetland and meadow habitats region-wide to measure how species and vegetation communities are responding over time to impacts from surrounding land use activities. With climate change and the ever-increasing demands on the land for further development, long-term terrestrial biodiversity data collection will help guide future decision-making with respect to restoration activities, environmental protection and the management of natural areas. Impacts, both positive and negative, to species and vegetation communities over time are associated with influences from surrounding land use activities. Urban areas tend to exert more negative influences from the surrounding land use areas than rural zones. It is important, therefore, to not just minimize habitat loss but also the negative influences that activities from the surrounding landscape exert on remaining natural areas. 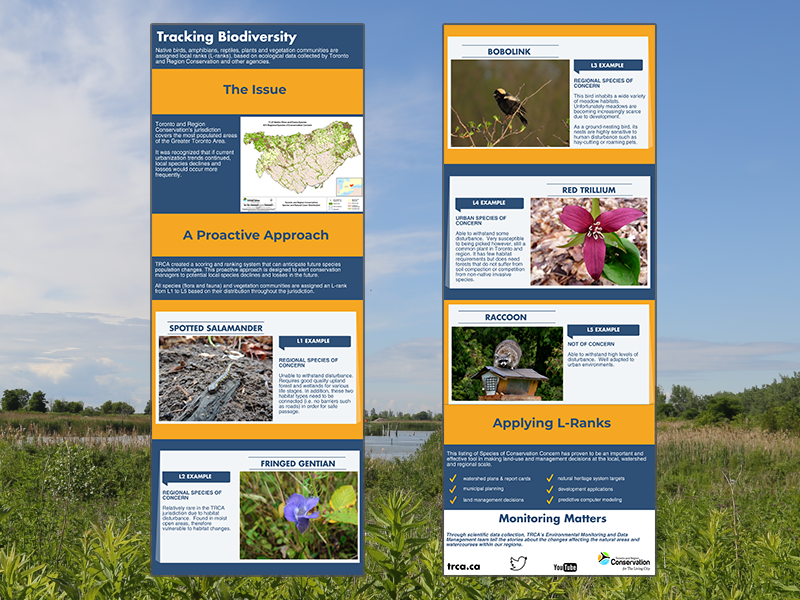 Since 2000, TRCA has collected inventory data on flora and fauna species as well as vegetation communities. These sites change from year to year based on funding, as well as land planning and management priorities. Trained staff conduct an inventory by visiting a natural area and documenting what they see and hear. Inventories are done during the optimum time of year for seeing or hearing a particular species. Vegetation Communities: TRCA surveys for 339 native vegetation community types when conducting biological inventories, including 187 Communities of Conservation Concern. Plant Species: TRCA surveys for 929 native plant species when conducting biological inventories, including 558 Regional Species of Conservation Concern. Breeding Bird Species: TRCA surveys for 159 native bird species during breeding season when conducting biological inventories, including 88 Regional Species of Conservation Concern. Reptile and Amphibian Species: TRCA surveys for 24 native reptile and amphibian species when conducting biological inventories, including 20 Regional Species of Conservation Concern. Mammal Species: TRCA surveys for 30 native mammal species when conducting biological inventories, including 11 Regional Species of Conservation Concern. For more than a decade, TRCA has been using a unique strategy in the protection of natural heritage systems within regional watersheds. All flora and vertebrate fauna species, as well as vegetation communities, found in the Region have been assigned a rank based on scores that measure their local abundance as well as their sensitivity to development impacts. The goal of this ranking system is to proactively identify species at risk of becoming rare, threatened or locally extinct. 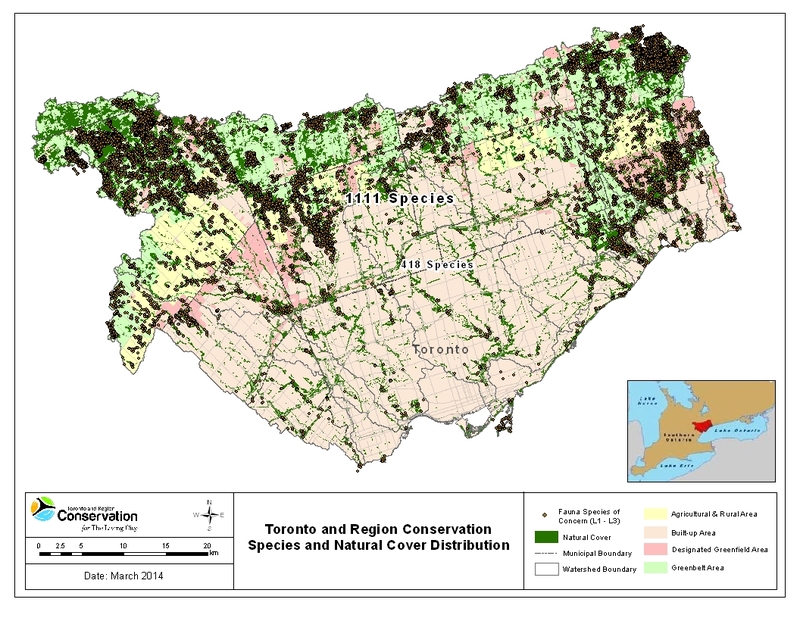 Based on this usage of a local scoring and ranking approach, 894 species in TRCA’s jurisdiction are currently designated as Regional Species of Conservation Concern. In the TRCA region there are 1111 native flora and fauna species. However, only 418 of these are still found in the urban core. The large majority of Regional Species of Conservation Concern are found only in the more northern, rural portions of our watersheds with large amounts of natural cover. Urbanization causes or accelerates many of the threats to biodiversity including: habitat loss, non-native invasive species, pollution, and climate change. It is apparent that the continual loss of natural cover and changes to surrounding land-use in urbanizing areas will only further exacerbate the loss of biodiversity occurring region-wide.